Online reviews of the second generation Acura NSX are often followed by commenters with polarizing views. There are those who are ready to embrace change, complimenting the car for its futuristic drivetrain and sensational turn of speed. While the rest remain hung up on the original NSX, criticizing the new car for not having a naturally aspirated engine, rear-wheel-drive, and a manual transmission because "everything was better in the old days." 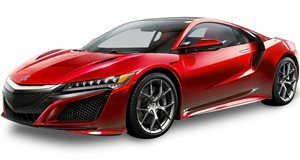 We had a good idea which camp we belonged to, but to make sure Acura loaned us a 2019 NSX in Casino Pearl White so we could discover whether it is the failure that angry commenters think it is or a worthy successor to the legendary first generation model that forever changed the sports car landscape. Back in 1990, the name 'NSX' stood for 'New Sports car eXperimental.' Unlike Ferrari and Lamborghini cars of the era, it was reliable, easy to maintain, and comfortable to drive every day. This new NSX, which arrived back in 2017, now stands for 'New Sports car eXperience. With this new car, Acura wants to revolutionize the sports car experience with the addition of hybrid power. For the 2019 model year, Acura has made some minor tuning changes to the steering, suspension, and hybrid system but unless you drive it back-to-back with the 2017 or 2018 models, you probably won't notice a major difference. The biggest change comes in the form of Continental SportContact 6 tires - 245/35R19 in the front and 305/30R20 in the rear - which help make the car two seconds per lap faster on the Suzuka Circuit in Japan. There are also some minor styling changes including a new Thermal Orange color, a revised grille, and an optional blue interior as seen on our test car. Even though the NSX comes from a Japanese brand, it was actually built and designed in the USA. The NSX has classic mid-engine proportions and sits alongside the likes of the Audi R8, BMW i8, McLaren 570S, and Porsche 911 as a $100k+ sports car. We'd have to give the styling crown to the 570S, though it is far more expensive than the NSX. Unlike the Porsche 911, which is a dime a dozen and completely blends in wherever you drive it, the NSX stands out like a true exotic. The minor changes to the car's front end for 2019 go a long way to cleaning up our previous gripe of having too many surface colors. The rear end also looks striking, especially with the optional carbon fiber spoiler on our tester. If you don't like attracting attention, you may want to look elsewhere. Even without the optional carbon fiber bits on our test car, this low-slung supercar will have your neighbors drooling with envy. The NSX really stands out under the skin with its advanced hybrid drivetrain. Only the BMW i8 offers a similar albeit far less powerful hybrid drivetrain in this price category. The majority of the power comes from a 3.5-liter twin-turbocharged V6, which produces 500 horsepower and 406 lb-ft of torque on its own. Acura then pairs the V6 with a trio of electric motors, one in the rear (mounted between the engine and the transmission) and two on the front axle (one for each wheel). Combined output is a rocket-launching 573 hp and 476 lb-ft of torque, which goes out to a Super-Handling All-Wheel-Drive (SH-AWD) system through a nine-speed dual-clutch. The 0-60 mph time seems to differ depending on who you ask. We timed it at around three seconds flat but some outlets have recorded the car sprinting to 60 mph in as low as 2.7 seconds. At full tilt, the 3,878-pound NSX can reach a top speed of 191 mph. Those electric motors primarily increase performance but do have a moderate impact on fuel economy. The NSX averages 21-mpg city and 22-mpg highway, though it is easy to exceed or fail to reach these numbers depending on how you drive. Stepping inside, Acura has made a deliberate effort to make the NSX feel special without impeding on practicality. The seats are extremely comfortable yet still capable of holding the driver in place during hard cornering. Our tester's Indigo Blue leather added a splash of excitement as did the optional Carbon Fiber Sport Package. All of the materials feel relatively upscale, and as if they belong on a six-figure supercar. Compared to rivals like the Audi R8 and McLaren 570S, we only wish the NSX had a more cohesive interior design. There are too many material surfaces including silver plastic, black gloss plastic, leather, and Alcantara, which feel jumbled compared to other interiors in the segment. We also had a few gripes with the NSX's center stack. At its core, the NSX uses an outdated version of Honda's infotainment. The system is laggy when changing menus and unlike other 2019 model Honda products, lacks a volume knob. We'd also like physical fan speed buttons for the climate controls, which are accessed via the touchscreen. Standard Apple CarPlay and Android Auto do ease the experience. While touted as a "practical supercar," the NSX lacks many features we expect to see on an average car or even a GT car. There are cupholders, albeit clip-on units like on the Mazda Miata, and a few handy storage areas between the seats and on each of the doors but most owners will have to rely on the rear trunk. Most mid-engine cars have a front trunk or "frunk" but the NSX has a bunch of electric motors up there. The only large storage area is behind the mid-mounted V6 that offers 4.4 cubic feet of storage. It's possible to fit a small set of golf clubs back there but the Audi R8 and McLaren 570S both offer more storage space. Since the trunk shares a space with the engine and has an exhaust located directly underneath it, it does get rather hot back there - the NSX doesn't make for an effective ice cream van. In the category of mid-engine supercars, there is no shortage of gut-busting monsters capable of ripping off 60 mph in three seconds or less. If straight line speed is what you're after, the NSX is happy to oblige with near EV-like acceleration. Place the car into its Track setting, press hard on the brake, mash the accelerator, then release the brake to be treated to your own personal rocket launch. The NSX pins its victims back in their seats, using the instant power available from its three electric motors. Although the NSX loves to shove your face where the back of your head used to be, its true skill is the ability to rearrange the organs inside your body with its cornering ability. No other AWD supercars in this category function quite like the SH-AWD system in the NSX. Since the front wheels are each powered by their own electric motor, the car's brain is able to send different amounts of power to each wheel, helping nudge the front end around a corner. The torque vectoring feels as though a divine force has taken over the front end, guiding the car around corners with precision. If you are the type of driver who wants to be fully in command of his car, this may not be the supercar for you. The NSX strokes its driver's ego and lulls them into a false sense of driving divinity. In the most aggressive Track mode with the traction control off, the NSX rotates sideways with ease, so we suggest only using this setting once you've had your morning coffee. Sport mode is the default setting but we found ourselves preferring the Sport Plus mode, which tightens up the drivetrain and transforms the NSX into a more of a brute. There is also a quiet mode for when you just want to go about your business without hearing any drone from the twin-turbo V6. We enjoyed the sound of the engine at full tilt but when leisurely driving around town, the exhaust note doesn't live up to the V8 and V10 engines from competitors. If you release the throttle after a quick burst of acceleration, the NSX does release some intoxicating waste gate noises but we wish Acura would have put more emphasis on making them louder from inside the cabin. Do not let the NSX's looks or ferocity through the corners deceive you, this is a truly livable supercar. Ride comfort is excellent even in the more aggressive drive modes and the quiet mode is serene on the highway. With the wonderful ELS Studio audio system, it's easy to forget that you are even driving a twin-turbo supercar - it could just as easily be a TLX or MDX. The NSX manages to balance its livable nature without falling prey to monotony. Steering is superb, even the most minor inputs cause the car to dance through the corners. Acceleration is relentless thanks to the electric motors, which can fill in the gaps when the engine isn't producing peak power, like during gear changes. Speaking of gear changes, Acura's nine-speed dual-clutch deserves to be recognized as one of the best on the market, right up there with Porsche's PDK. Its shifts are buttery smooth under normal circumstances and blistering quick during full-throttle acceleration. Aside from low ingress and egress points and small trunk, we'd be happy to drive the NSX every day as our only car. The original NSX was famed for its reliability, so this new car has some big shoes to fill if it wants to retain this reputation. Since this second-generation NSX has only been around for a few years, it's difficult to say how it will hold up in the long term. Owning a supercar doesn't come cheap but judging by a few service bulletins posted on the NSX, Acura has managed to make servicing the car much easier than cars from Audi, Ferrari, or McLaren. We won't go ahead and call it cheap but we expect the long-term ownership experience of the NSX to be more manageable than most other exotic cars. Since its reintroduction in 2017, the NSX has only been recalled for minor issues including a brake light malfunction and a faulty fuel tank on 2017 and 2018 models. If you buy a 2019 model, you should be in the clear. During our few days with the car, the NSX functioned like clockwork without any issues. Although it's hard to call the NSX cheap with a starting price of $157,500, it is a relative bargain compared to its rivals. An Audi R8 starts at $164,900, a Porsche 911 Turbo will set you back $161,800, and even a base McLaren 570S costs $208,800. The BMW i8 is cheaper at $147,500 but with only 369 hp on tap, it doesn't match up well against the NSX. Acura has raised the price of the NSX by $1,500 for 2019 but justifies the price increase by including $4,700 worth of standard features. These include parking sensors, navigation, four-way power seats (manual seats are a no-cost option), and a nine-speaker, 580-watt ELS Studio audio system. Our tester was decked out with options including Casino White Pear paint for $700, Carbon Fiber Exterior Sport Package with Carbon Fiber Engine Cover for $12,600, Carbon Fiber Roof for $6,000, Carbon Fiber Spoiler for $3,000, Carbon Ceramic Brakes for $10,600, Interior Carbon Fiber Package for $3,800, and Satelite Radio for $500. As tested, our tester rang in at $194,700. We'd recommend dialing it back on the options to keep the NSX below $170,000. We don't typically like to mention used prices in our reviews but if you are willing to take a 2017 model with some miles on it, used examples are available starting as low as around $120,000. Some dealerships even have leftover 2018 models on the lot, so you can probably go in asking for up to $30,000 off the sticker price. Acura only sells around 200 to 500 of these per year, so you'll certainly be in a small circle if you buy one. Even in its best sales year in 2017 (581 units), the NSX actually sold fewer examples than Audi R8 and the McLaren Sport Series. This isn't necessarily a bad thing if you want to be the only one at your local Cars & Coffee to show up in an NSX. Acura's use of electric motors and computer wizardry hasn't made the supercar experience boring, it has made it better. We don't care what car you show up in for a Sunday cruise up a mountain road, the NSX will keep up with it. It will then bunker down into its Quiet mode, transport you home in perfect comfort and civility, and remain reliable while you pile up the miles. Our one suggestion to Acura would be to increase the NSX's battery size, allowing it to be driven further on electric power alone. This would involve turning the NSX into a plug-in hybrid, making it an even more respectable daily driver. Even as it sits, we believe the NSX deserves your consideration. If you like being on the cutting edge and helping to drive innovation, this is the supercar for you. The NSX earns a CarBuzz rank of Great Buy.